Black-tailed Godwit , LR Plover x 4 and Dunlin. Pochard x 4 , Wigeon , Shelduck x 2 , Ruddy Shelduck and 10 x LR Plover......R Berry. Ruddy Shelduck in Tad Bay..............Birdguides. Ruff and 2 x Greenshank..............TVB. Little Tern untill 15-00 only , also Black-tailed Godwit.........Birdguides. Sandwich Tern x 4 early morning flew through south calling.......C Waring. Osprey over Blithe Bay this morning.........Birdguides . Black-tailed Godwit one present this afternoon......Birdguides. Common Sandpiper x 3 on the dam and 2 x LR Plover at west end.......BB. Black-tailed Godwit x 4 on main lake this afternoon........Birdguides. Spotted Redshank one in Blithe Bay..........J Allen . Green Sandpiper one present this afternoon , also Redstart........Birdguides. Common Sandpiper x 4 on the dam and 2 x LR Plovers at the west end......BB. Quail still singing in barley field between rough track and Sittles Farm........Birdguides. Red Kite over A51 approx 2 miles south of Stone at 11-45...Ian Howard. Crossbill x 10 this morning........NP. heading south east at 17-55..........R Gilbert. 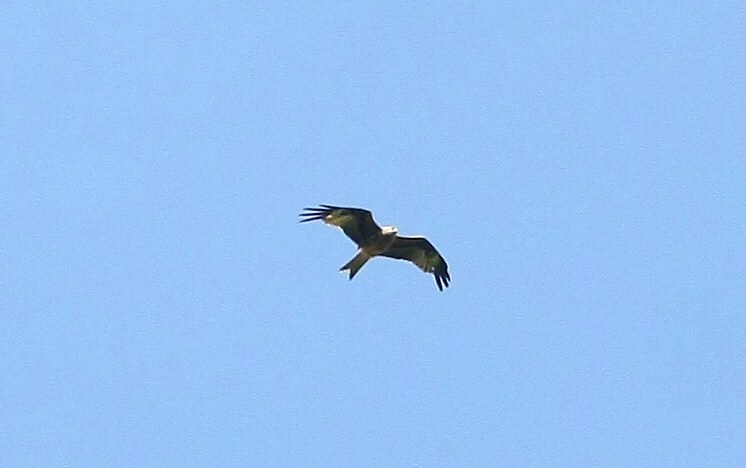 Red Kite over heading towards Trentham at 14-30.....N Griffiths. Red Kite over Highgate.......photo by H King. Ruddy Shelduck pair at west end......BB. Red Kite over southeast at 17-00......H King. Cuckoo x 3 this evening.....D Powell. Spoonbill still present in Tad Bay.......Birdguides. Spoonbill still present this morning in Tad Bay......Birdguides. Red-breasted Merganser still present this afternoon.......S Turner. mid-afternoon , also Osprey.........NS, GM, RB, SS. Raven x 5 (3 x juv) this morning .........SS. Red Kite over B5066 at 8-40 this morning.........Birdguides. Yellow Wagtail in potato field..........Birdguides. Common Scoter drake still present today......BB. Red Breasted Merganser one present , also Whimbrel..........Birdguides. Red Kite one over today......K Clements. Osprey again today over Tad Bay viewable from causeway.......Birdguides. Spotted Flycatcher still two present this morning........SS. Osprey still present today in Tad Bay viewable from causeway.....Birdguides. Hobby and Cuckoo this evening.......D Pointon. Common Scoter drake still present , also Hobby........KC. Crossbill x 6 this morning , also 4 x Lesser Redpoll......RT. Osprey two present this evening.........Birdguides. Spotted Flycatcher two present today......N Griffiths. Common Scoter drake still present.......BF. Red Kite over at 8-45 this morning.........BF. Common Scoter drake still this evening........Birdguides. Spotted Flycatcher one present around the tower mid-morning but elusive.....SS. Insect News: a Long-tailed Blue butterfly was found in a private house in Alrewas, Staffordshire at 19:45 yesterday. This individual will have almost certainly emerged from vegetables purchased from a supermarket. They are normally associated with legumes so can come with 'petis pois' which are commonly imported from southern European countries.........Birdguides. Crossbill , Greenshank and Redshank this morning.........SG. Common Scoter drake off the dam this morning....Birdguides. Wood Sandpiper one this afternoon.........Birdguides. Red Kite over the high school today........AM. Quail singingin field between rough track and Sittles Farm.......Birdguides. Med Gull immature in Blithe Bay mid-day.........Birdguides. Osprey over heading towards Westport Lake @17-09........Birdguides. Black-tailed Godwit x 3 and 2 x Ringed Plover.......A Dean. Common Scoter x 5 from Scott Hide mid-afternoon......Birdguides. No sign of Lesser Yellowlegs today......Birdguides.